Unwrap the salmon from its packaging. Place it in a shallow pan, and cover the pan with aluminum foil. Place the salmon in a leak-proof, plastic, sealed bag. Never defrost the salmon with hot water because this can cause bacteria to grow. Avoid defrosting salmon in the microwave because it will heat unevenly. 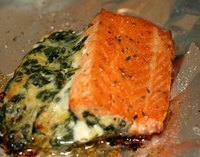 Do not defrost salmon at room temperature because this promotes the growth of bacteria.